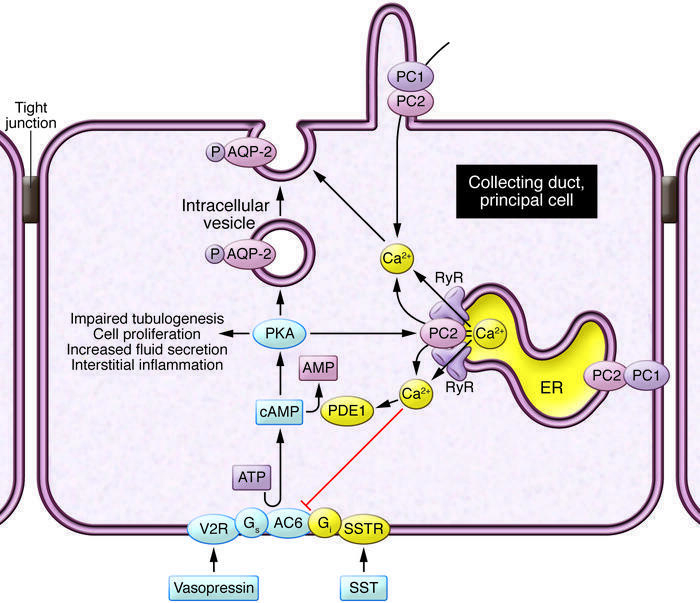 An abnormal crosstalk of calcium and cAMP signaling disrupts multiple signaling pathways and leads to the cystic phenotype. Activation of calcium-inhibitable adenylyl cyclase 6 (AC6) and inhibition of calcium/calmodulin-dependent phosphodiesterase 1 (PDE1) causes abnormal accumulation of cAMP and activation of PKA. Disrupted intracellular calcium homeostasis interferes with aquaporin-2 (AQP-2) targeting to the apical membrane. Sustained PKA activation of PC2 and RyRs makes these channels leaky and leads to reduced intracellular calcium stores, further driving cAMP/PKA signaling. PKA activation also disrupts tubulogenesis, activates proproliferative signaling pathways, stimulates chloride and fluid secretion, and promotes STAT3-induced transcription of chemokines and cytokines. Vasopressin V2 and somatostatin (SST) stimulation of their respective receptors (V2R and SSTR) results in increased cAMP. Gs and Gi refer to guanosine nucleotide-binding proteins s and i, respectively. Yellow indicates proteins that are reduced in PKD; blue indicates proteins that are increased in PKD.